If you’ve been paying attention to the trends in modern shooting sports you will have noticed that manufacturers are offering more and more heavy barrelled rifles chambered in magnum calibres suitable for long range shooting. Many of these rifles are built with heavy barrels and chambered for cartridges which would once have been considered very exotic and which are designed specifically for shooting at long ranges. Constant innovation and development is also pumping new and ever more efficient and effective long range and specialist precision ammunition into the market to satisfy the ever increasing demand for long-range precision shooting. That demand is never likely to fade as long as the enthusiasm for long range shooting lasts, whether you are a serious long range target shooter or just enjoy the challenge of pulverising watermelons or milk jugs at 1000 meters there is a long range shooting discipline for you. 2019 Update; the range of long distance shooting disciplines available nowadays is so diverse that there isn’t just one scope that we can recommend so as well as giving you tips on the features to look for in an ideal long range scope, in this updates article we will discuss the best long range scopes available at every price point as well as a few manufacturers who are particularly well known for producing the very best rifle scopes for long range shooting. It’s worth defining what long range shooting is before we consider which scopes might be most suitable. 120 meters might be long range with a .22 rim fire that you might normally use at 50 meters and there are so many centre fire cartridges available now with vastly different ballistic characteristics and performances that there is no single distance that can be classed as ‘long-range’. 500 meters is long range for a .223 while a .308 can be effective in practiced hands up to 1000 meters and a .338 Lapua magnum or .300 Win Mag can reach out even further. For the purpose of this article we will be focusing on long range centre fire rifle shooting in the Nomad Rifleman style. Every scope obviously has an objective lens but what should you be looking for in a scope for long range shooting? The purpose of the objective lens of a scope is to gather light which forms the image you see when looking through it. The larger the objective lens the more light the scope can gather making it more useful for shooting in low light conditions such as at dusk and dawn. Also a larger objective lens gives a larger field of view making it easier to track and spot targets. Even for long range shooting though you don’t need the largest objective lens on the market. All things being equal, a larger objective lens will provide you with better low light performance and a larger field-of-view but they can also change the balance point of your rifle and add weight and bulk. For long range shooting though this added weight shouldn’t be a major issue as generally your shots will be taken from rested positions on a bipod or rest. 30mm tubes are sometimes found on some of the more expensive, high end scopes. These aren’t strictly necessary for long range shooting but the extra 4mm of tube diameter over and above the standard 26mm (1 inch) scope tubes can allow these scopes to be built more robustly and to fit larger internal lenses for improved light transmission and image quality. They do not automatically increase brightness though, as many assume, as the exit pupil of a scope is determined by the magnification and objective lens of the scope not the diameter of the tube. This will be a feature to consider for the really serious shooter looking for the very best scope money can buy. 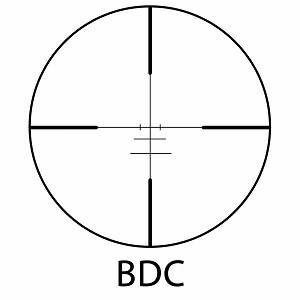 BDC reticles tend to be most useful on rifles intended for use at multiple ranges rather than for dedicated long range shooting. They allow quick and easy adjustment using the integrated additional aiming points for shooting at different ranges without a need to adjust the scopes zero or estimate hold-over or windage adjustments. These reticles are designed specifically for a certain calibre though and can’t easily be switched from rifle to rifle. Many times, people have changed ammunition or found himself hunting at a different elevation and found that there aiming references were several inches off what they were expecting. This can be disastrous to a hunt or competition. BDC reticles are most commonly produced for rifles chambered in multipurpose cartridges such as .223 and .308. If these cartridges aren’t what you shoot at long range though you can shop around for other suitable reticles and some manufacturers will produce custom reticles to your specifications. Leupold and most custom shops will take your load data from a given cartridge and rifle combination to produce a custom turret and BDC reticle combination to perfectly suit your requirements. This is becoming more common and cost-effective all the time, don’t be afraid to take advantage of this technology. These reticles add no measurable complexity and zero weight to a rifle scope so certainly can’t be discounted on grounds of bulk or difficulty to use. Consider though that if you are setting up a scope and rifle combination specifically for long range shooting a BDC reticle may be redundant as you won’t be switching ranges a lot and will have time to accurately range find your targets and make corrections if you do need to engage targets at multiple ranges. Bear in mind as well that the additional markings on a BDC reticle may just obscure targets at extreme long range. Target turrets perform exactly the same function as the standard windage and elevation turrets on your scope except that rather than being quite small and unobtrusive and accessed by unscrewing a small cover to allow you to make adjustments they are large and marked for easy adjustment. They make adjusting for windage and elevation much simpler and once these adjustments have been made you don’t need to guess at how far to hold over or adjust for wind. Making accurate adjustments does require that you know the exact range and wind speed that you are shooting but the same is true of a BDC reticle and target turrets combined with a standard uncluttered reticle allows for a much clearer sight picture at long range. Range and wind calculation and adjustment is all part of the skill set of a long range shooter and finger adjustable target turrets makes the most of those calculations allowing them to input them into your scope and take a calm, considered shot without having to hold over, under or to one side of a target, once you’ve made your target adjustments you can just aim dead on. These turrets also allow you to easily return the settings to your ‘zero’ range ready for another shot under different conditions. A potential downside is the tendency for overly large turrets to snag on your kit and undergrowth they won’t snag any more than the rest of your rifle. While it may be awfully tempting to get as high magnification a scope as you can afford remember the magnification of a scope is not the most important feature. Being able to zoom in to a target can allow you to be more precise but it also increases the cost of your scope, makes it heavier and the higher the magnification the larger objective lens will need to be to get the same amount of low light performance. It will also mean that you have a smaller field of view when you zoom in. With zoom ratios of 6:1 becoming commonplace on sporting scopes, and especially tactical scopes, you can take advantage of true 3-18x power scopes that will cover about all the bases you need for both close and long range shots. However, these scopes are expensive and heavy compared to contemporary 3-9x or 4-12x power scopes. When determining how much magnification you need consider the size of your target as well as the range, shooting squirrels with a .22 long rifle might require higher magnification, maybe 12x, even if you only ever fire shots at a maximum range of 50-100 meters due to your quarry’s small size and requirements for precise head shots. Shots taken with a .30-06 at elk and moose might be taken at twice or three times the range but the significantly larger size of your quarry means that 6 or 8x magnification will probably be sufficient in most situations. While scopes can be had for just a couple of hundred dollars serious long range target shooting requires a serious consideration of your equipment and any scope under $500 is a fairly cost effective option as long as it performs. 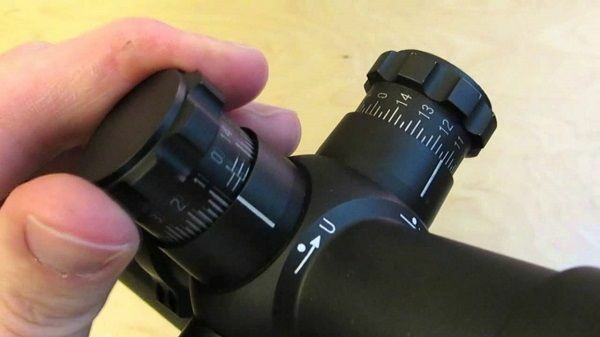 These scopes punch well above their weight and offer excellent value for money. This scope represents the best value that Vortex Optics has to offer long-range shooters. It inherits many of the innovative technologies that Vortex has pioneered for their more expensive models but has done something to sell this at a lower point. All of the quality you can expect from premium products is present in this budget scope and the lenses, glass and the scope it ‘self appears to be just as durable as any high end scopes. This is a second focal plane scope and the fully multicoated lenses are amazing. It is water, shock, fog, and dust proof and features a dead-hold BDC reticle. Great video on How to use Vortex Dead Hold BDC Recticle? With turret adjustments and even side focus parallax adjustment, everything seems to be here. If you are after good quality scopes for under $300.00, this is probably a good place to start. These are one of Vortex’s best-selling optics for a reason. Out of left field came a company called Athlon. No one had heard of them but they were offering a scope with all of the features you would expect on a high-end optic but for a fraction of the price. As with any new manufacturer people took time to warm to them but they have now cornered the market of budget long range scopes. Amazingly, the glass is nearly as good as some of the best scopes on the market. It is fully multicoated and paired with a huge objective lens. This combination maximized brightness and contrast for those low-light or dreary days. These are options normally seen on high dollar scopes. The most common places for cheap rifle scopes to skip is in durability. Athlon didn’t do that with the Argos. It is fully waterproof and even purged for fog and condensation resistance. It handles shock well, even from the heavy recoil of magnum calibers. This package is very comparable with higher priced scopes but at a fraction of the price. This is also a first focal plane scope with an etched reticle and turret adjustment. Just like all of the major long range scopes. It has a mil-dot reticle that seems to be accurate. You would be seriously hard pressed to find any other optic at this affordable price that could do the same. There is no doubt that this all American company produces some of the best scopes in the world. Leupold has been the go-to choice for many military units and police departments for decades. While many people think you need massive magnification for distance that really isn’t true. Most sniper rifles max out at 10x making this 9x scope a hairs width shy of rifles known to be accurate to that 1000 yard mark. For your 5.56 or 7.62x39 rifles, this is all you will ever need. This fine optic also features a proprietary illuminated firedot reticle. This aids you with shot placement and combines very well with the low-profile turret adjustments to get you right on target. Of course, being a Leupold you will have no issues with water, fog or anything else getting inside the sealed and argon purged tube. This scope was designed for patrol use and is tough as nails and hard wearing. One of these days, you will be passing this on to your kids in still perfect condition. Bushnell’s one of the world’s largest sporting optics manufacturers. Their rifle scopes can be found on the shelves of Walmart and in the showcases of the finest hunting outfitters on the planet. Many of their models are purpose driven to do a specific job in the field, this scope is one of them and its purpose is long distance shooting. At its heart, this is a long-range hunting scope capable of kills or general shooting at 500 to 800-yards easily. With a max 15x and Bushnell’s own LR-600i BDC reticle, this is a perfect match for hunting calibers like .270, .308, or .30-06. It even does an astounding job for long range varmint hunting in calibers like .22-250. It may be a little light on features compared to some other scopes but with zero-reset turrets, great lenses, a good reticle, and bucket loads of durability, what more could you be after? This is a serious scope for the serious long range hunter. With all of the quality you would expect from a Bushnell, this scope has amazing glass with superb clarity. With waterproof, fogproof, and shockproof construction, this may be one of the best value scopes under $500.00. Backed by a lifetime guarantee, Bushnell apparently trusts the quality. If you’re shooting the ever popular .308 Winchester cartridge, this scope is for you. Specially designed for the ballistics of this popular and highly available round, the P-308 from Nikon is a good scope with a great price. Maxing out at 12x, this scope is the perfect power for the moderately ranged .308 cartridge. Thousand yard shots are tough with that caliber anyway so why waste money on a scope more powerful than what you need? The reticle of this scope is tuned to shooting a 168 grain match load and will take all of the guess work out of bullet drop. All adjustments are handled with convenient 1/4 MOA turrets. For the price, this is a great setup for your M1A or Remington 700 but would perform well for any .308 rifles. Not to leave out Nikon’s great glass and astounding quality and durability. This scope is no different with only the best that Nikon can produce. Overall, this is a high value scope for those on a budget. For the money, this is a tough scope to beat. The Viper HS-T from Vortex Optics is a 6-24x50mm scope that packs as much optical power into a package as possible. Offering outstanding value for the money, there is more proprietary technology in the scope, than most any other on the market that all comes together to make one of the best long-range shooting packages you could hope for. This scope uses premium fully multicoated, extra-low dispersion lenses to bring out the most color fidelity and highest-quality resolution possible. The XR coatings on this scopes optics provide enhanced light gathering and the combined armor tech coating protects the lenses from scratches and where. Exposed target turrets are constructed for precise finger adjustable clicks. The CRS zero stop system allows for reliable return to zero after dialling in temporary elevation in windage corrections. Great for a 6.5 Creedmoor rifle or for .300 Win Mag that may be used for shooting at multiple ranges and require a lot of adjustment for different shots. The four acts zoom ratio provides as much versatility as possible while combining side focus parallax adjustment to dial in very small details for very long range shooting. The fast focus eyepiece has non-critical eye relief and allows you to quickly adjust the reticle to your eye. The scope is made from a single piece of aircraft grade aluminum and is double O-ring sealed and hard on purged to make the scope rugged and dependable, like all Vortex products. This is a simple and reliable rifle scope that is available in three different models, a hunting model, a shooting model, and a tactical. It offers several different reticles and one of the best long-range optics for hunting and shooting on the market, dominating almost all other scopes for under $1000. After decades in the optic industry, it is hard to deny that Nikon knows what they are about. With more combined years making lenses for everything from cameras to telescopes, they have it down to a science. The Nikon Black is their attempt to bring all of that knowledge to a rifle scope and they have done a marvelous job! Straight out of the gate, the optical quality of the Nikon Black series is astonishing. They have a full set of multicoated lenses combine with a perfectly sized objective lens to give you a vibrant and clear image. Combined with a massive 24x magnification, this second focal plane scope can reach as far as your rifle can. All Nikon scopes are made to stand up to the worst conditions including rain, cold, fog, and even blowing dust. With it’s sealed and purged interior, there is no doubt that this scope will do the same. It may not be the tank-tough optics of some brands but with a little caution, you will have a scope for a lifetime. With adjustable parallax focus, great eye-relief, and zero-reset turret adjustments combined with either a MOA or MRAD reticle, this is a purpose built tool for the long range shooter. While I would hesitate to call this a cheap long-range rifle scope, I would say it is easily one of the best values on the shooting market today. Bushnell has been in the optics game for long enough to have it all figured out. They produce a large range of optics, some of which have not been the highest quality. That changed when they made the dedicated Elite Tactical line of scopes. Bushnell uses their own proprietary multicoat technology combines with good glass to create lenses that optimize light transmission and color. You get a very bright, high contrast image even in low light conditions. The lenses filter color maximizing your ability to distinguish your targets at the ranges this scope can reach. One of Bushnell’s only first focal plane optics, this scope has an etched mil-has reticle that is perfect for beginning long range shooters. Combined with oversized turrets for easy adjustment of windage and elevation, this scope has everything you need for ultra-long range shooting. It also makes long range varmint shooting quite fun. Not only has Bushnell upped their quality, they did the same with durability. The Elite Tactical is tough as nails, waterproof and sealed against fog and condensation. This scope will perform in places you would never willingly go. Bushnell deserves a standing ovation for what they have delivered with their best scope to date. Swarovski have one of the best reputations of any premium scope manufacturer and to get a scope like this for under $1000 is an absolute bargain. While it doesn’t have the magnification of some of the other scopes listed here it is plenty for most mid to long range shooting scenarios and this model features a reticle which will aid in making adjustments for range. With Swarovski products you get glass and coating which are second to none and which will last you a lifetime. Millet is one of those companies that you don’t hear of frequently, they seem to have fallen out of popularity. This is really a shame as their scopes have always been great quality. This does mean that you can pick them up quite cheaply at the moment. With is 25x magnification, this is almost an overpowered scope and capable of keeping up with the most demanding calibers. If you are after something to mount on a rifle chambered in 6.5 Creedmoor or any of the long range magnums, this is a very good choice. It happens to be a personal favorite for shooting with the .300 Win Mag. While Millet uses glass that is not known to be as good as some premium brands, they do fully multicoat their lenses for enhanced light transition. The enhanced clarity and brightness are noticeable. When combined with the illuminated reticle, you get an optic that functions perfectly from dawn to dusk. Like any optic should be, the Millet LRS-1 is water resistant for those times the weather might not be great for hunting but you are out there anyway. The lenses may fog if you take it from warm to cool quickly but with a little time, they usually clear up. For a tactical scope, this is a solid performer and one that won’t break the bank. If you are for good long range scopes for under $1000, this is one you should consider. 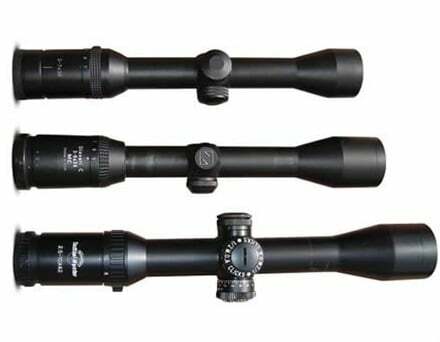 Standing above the competition, the NXS series of scopes are the hallmark of NightForce’s lineup. They use only the toughest, high quality materials and the best technology to produce a scope unequaled by other consumer level companies. The only place you will find better is in contract companies like USA and you can expect to pay upwards of $3000.00 for such an optic. With what is simply some of the best lenses produced today, they do everything to make sure the view is perfect. Multi-coated glass and parallax adjustment paired with a large diameter objective lens, you get the best there is. If you want big range, this is the scope you need. Simply put, the NXS MOAR reticle is one of the fastest and most accurate you can get. It does take a little practice to read well. This is an illuminated reticle that is high contrast and easy to see making low-light or overcast shooting at long distance possibility. Fully shock resistant up to the heaviest calibers and sealed to prevent water intrusion or internal fogging, the NXS can take the abuse. Enough so that several countries have recently opted to use these for their sniper rifles. From the punishing cold of northern Canada to the Middle East, these have seen service from hunters and military alike. You don’t get on the top of this list by producing an inferior product. Claiming number one is a matter of doing everything right. No matter what you want to use it for or where you plan to take it, the NXS will outperform 99% of the optics available no matter the climate or conditions. As stated above, NightForce makes amazing products. Some are slightly more amazing than others but all are better than most other brands. If you want a NightForce for a little less money, maybe the SHV is a better choice for you. Known to be the most rugged scopes available, all NightForce Scopes are built to survive no matter what conditions you encounter. Shock, water, and fog proof, they are good to go anywhere you need them. This scope may be a little less durable than the NXS but you are never likely to notice. Available with the preferred MOAR reticle with quick turret adjustments, dials you in on targets at huge ranges. This scope is more than capable of getting out to a thousand yards if you are. If you are shooting a magnum rifle like .338 Lapua or even the famous .50 BMG, this is a great optic to top your rifle. It also serves well on any distance gun from the common .308 to the famed 6.5 Creedmoor. If you are interested in long range shooting, this is the go-to scope to get you there. With a fast parallax adjustment, long eye relief, and just about everything else you could ever want in a scope, this is where you should be. It may be costly but it is high in value and built like a tank. Easily one of the best long-range scopes for under $2000. It is hard to downplay exactly how good a NightForce optic is. You simply won’t understand until you put your hands on one. It may take a little faith to spend the money but once you do, you will be sold for life! Which is about how long these scopes last. Vortex Optics is one of those companies that came out of left field. They were unknown until they started dealing out scopes that were far better than the competition for half the price. While the costs have normalized to the market, they are still one of the best values in optics today. In the case of the Viper, you get a scope that has fully multicoated lenses and an etched first focal plane MRAD or MOA reticle. These are features found in the highest end military scopes that cost thousands more than a Vortex Viper. With the capability of taking anything from your AR 15 all the way up to the most powerful magnums out to their maximum range, this is the scope you need to maximize the ballistic potential of any cartridge. Rifles like the M1A and AR 10 are perfect candidates but this would match well with any bolt-action rifle as well. With turret adjustments, you can narrow down your error to get you on target at the farthest ranges you will ever shoot. This combines well with some of the best glass you will ever get for the money. Nitrogen purged and sealed, this is a fully water, dust and fog proof optic that can handle any conditions you feel up to shooting in. Simply put, it is one of the toughest scopes on the planet and backed with unusually good customer service. If this is the first time you have heard of Vortex, I promise it won’t be the last. They are hard to beat! When I was a police sniper team leader, we used the Leupold Mark 4 and it is a good scope, however 20 years later when I compare it to the Vortex Razor, both in glass quality and in other characteristics, the Razor stands far above. 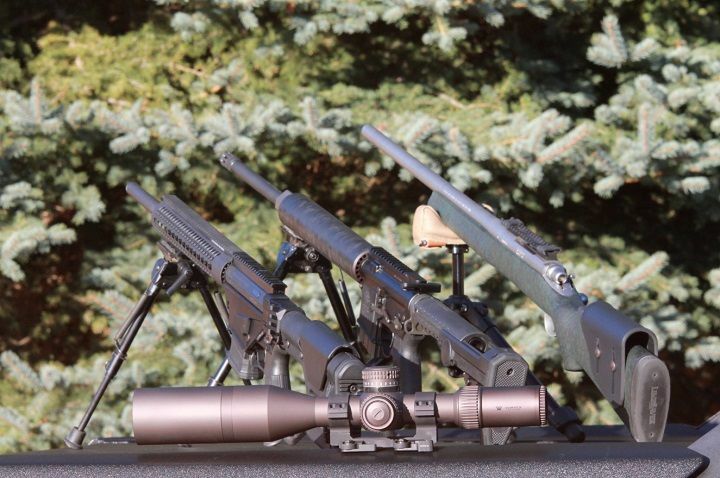 ​When shooting Beyond 1500 yards, being able to dial a scope a large amount is important. With the Razor, Humphries is able to get the 78MOA he needs for a 1-Mile Shot at over 7,000 feet elevation. This scope will not disappoint, which is evidenced by its popularity in PRS style matches. It is every bit as good as a Nightforce or Leupold, and is a much better value. A potential problem with scopes for super long range shooting, especially if you are sparing no expense and going for the kind of quality glass, construction and performance offered by a high end scope manufacturer like Schmidt and Bender is that the scopes can be quite large and heavy. This isn’t always a problem if you are shooting with a heavy rifle from a rested position but if you want to fit a quality scope to a lighter weight package for tactical marksmanship you may prefer something more compact and light weight. This product from Schmidt and Bender meets that criteria and is a scope which can perform as a fantastic long range tool without adding too much weight or bulk to your rifle. With its zoom range taking you all the way down to three power it is extremely versatile and can be used at close range as effectively as long range and also features an illuminated red dot. Zeiss are well known for producing some of the best optics on the market and this model is no exception. Every feature is tested and proven and designed to be used not just to look fancy on a bench rest. All the controls are tactile and intuitive enough to be used with gloves on and the finger adjustable turrets allow you to make adjustments before your shot. The reticles features as options with this model are specialised for hunting to provide minimum target coverage so you can see your target clearly and aim precisely for the vitals and make a clean kill at any range. This may just be the ultimate long range scope. It was developed by Schmidt and Bender when US Special Operations Command (USSOCOM) needed a scope for extreme long distance shooting. Schmidt and Bender may well be the best manufacturer of optical equipment in the world and while you do pay a premium for it if you are very serious about your long range shooting, or the stakes are very high, you couldn’t possibly go wrong with this scope. While it may not look like it from the low profile of the scope it does feature target turrets and is available with a range of reticles for you to choose depending on your specific needs. All the offered reticles are designed specifically for ultra-long range shooting and give you features to aid with range finding and adjustments. The quality of the glass and coatings in these scopes just won’t be matched by any other. Whatever your final choice though make sure you get thoroughly to grips with all its features. Learn the scope like the back of your hand and make sure that when you are ready to compete, take a shot at a live animal or carry your weapon into combat that you have put plenty of rounds down range with it and know exactly how to make the most of your best long range rifle scope. Good article, but please please have a friend edit before posting. There were so many misspellings and extra words thrown in it was painful to read. Just sayin, bro! Thank you very much for your helpful comments. We’ve revised the article and applying that to all of the existing articles. Great article, how come no one ever mentions the Athlon scope line, they have some very nice scopes at a very nice price. The Athlon scopes have great optics and are great for long and extremely long range with no problems. Oh did I mention that Athlon scopes come with a lifetime warranty. I have a Athlon Argos on a 338 lapua, and have made some great shots at 1200 to 1800 yards with no problems and at 1000 to 1200 yards and placed all my shots within a 12 inch target. When I sighted in my scope and gun at 100 yards, an by the time of was done I can place all shots dead center of my targets with all my shots ( bullet holes ) touching each other. I can credit those shots to my Athlon scope, Lapua 250 grain full Metal jacket ammo, and last but not least my 338 lapua rifle. Sorry for taking up so much time, I totally got off track, but I would like to know why no one ever mentions Athlon scopes. Thank you very much for reaching out to us. The truth is, there are so many good scopes out there that is impossible to include them all. I can think of at least three brands that are not mentioned that make great scopes. We revise our products as frequently as we can and have chosen to include the Athlon Argos going forward. Your feedback is much appreciated! How can you possibly leave out Zeiss & Swarovski products and yet include Bushnell and Nikon? We aim to review products suitable for every budget so have included products from the likes of Nikkon and Bushnell, to fully cover the topic though and bring to the very best of scopes we have restructures the article to include premium scopes from the very best manufacturers including Schmidt & Bender, Zeiss and Swarovski. Thanks for your feedback!